A 3-channel video installation created as part of the Graduate Certificate of Visual Art (Victorian College of the Arts, Melbourne). The installation was based on a smartphone video I’d found on YouTube of captured Syrian soldiers who are being forced to march across the desert, stripped naked, taunted by cries used for herding sheep. The aim of the installation was to make these images not only visible but unavoidable. 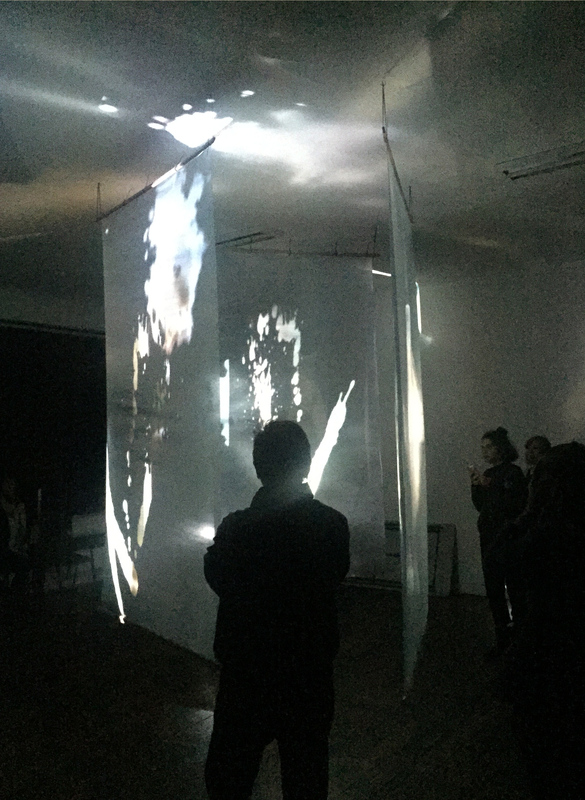 I created a physical structure resembling a triangular screen, which viewers could walk into and out of, thus surrounding themselves with projections of the images. My aim was to take these images out of the screen which can be easily switched off, or the thought which can be easily dismissed, and to bring them forward into physical reality. Images of war are either censored in mainstream media, or fragmented and repeated endlessly until they lose all meaning. We are either protected from the truth, or desensitised to it. I edited the YouTube footage to create a constantly changing, fragmented and relentless loop, echoing media portrayals of conflict. I also wanted to remove contextual markers of time, place, language and race. Video of ink and paint was incorporated to create ambiguity and remove contextual clues. I recorded audio of my own footsteps on concrete, which I multiplied and looped as part of the installation, to further disrupt the context of the images. 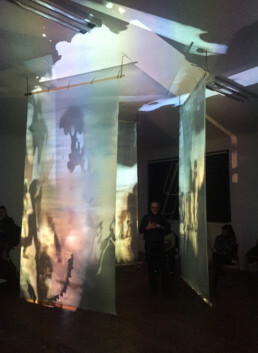 The aim of the video, thus abstracted from its original source, was to avoid a specific narrative such as those found in mainstream media portrayals of war, instead focusing on the simple image of complete human vulnerability. 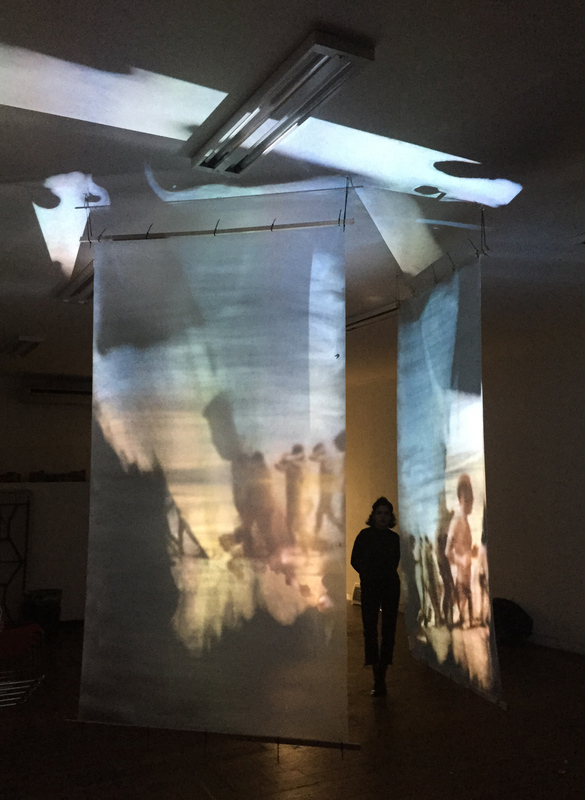 Three custom-made rear-projection screens, made from clear vinyl and sprayed with window frosting, were suspended from the ceiling, forming an open-ended triangle. 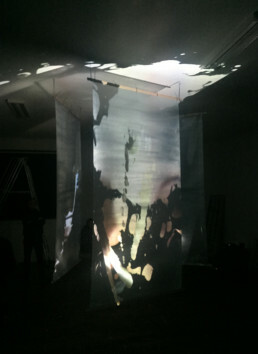 The same video sequence was projected onto the three screens from the outside using three projectors set up on stands. The positioning and size of the screens allowed viewers to watch the video simultaneously from the back and the front, and to walk around and inside the triangle formed by the three screens. The feel of the installation was purposely DIY - vinyl and wood were cut by hand, frosting applied from a handheld can, cable ties were used to fix the screens to planks of wood and to suspend the screens from the ceiling. The installation intended to echo the home-made instruments of war and torture used in many conflicts around the world. By using materials that could be found in the garage or the hardware store, I hoped to show that images of war do exist in our homes, only on a much less intrusive scale. In our day-today lives, these images are easily dismissed, either by choice or as a result of distraction. In contrast, I wanted to make a larger-than-life home for these images using familiar, day-to-day objects, in order to make the images tactile, accessible, all-encompassing - and therefore unavoidable.